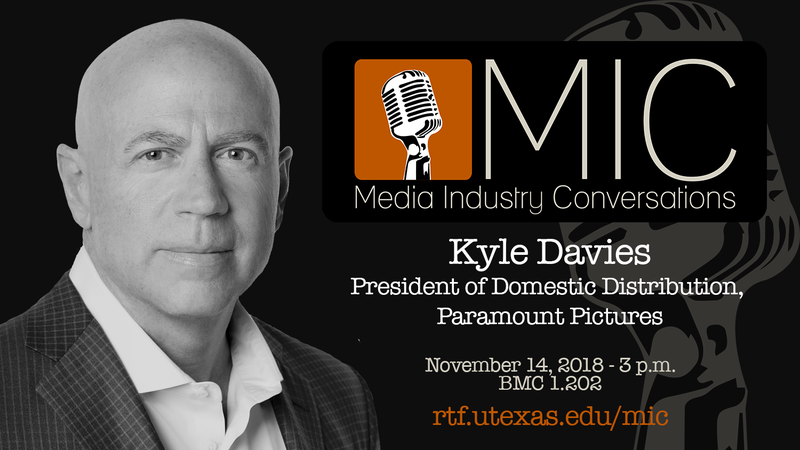 When: Wednesday, November 14, 2018 - 3-4:15 p.m.
Kyle Davies (Adv/RTF BS ‘85) discussed his career trajectory, his roles and responsibilities as the President of Domestic Distribution at Paramount Pictures, and his views on the current state of the film industry. Kyle Davies joined Paramount Pictures in 2016 as President of Domestic Distribution, overseeing the release of dozens of movies, including ­Arrival, Fences, Transformers: The Last Knight, Daddy’s Home 2, Annihilation and recent hits A Quiet Place, Book Club and Mission: Impossible - Fallout. His domestic theatrical distribution team is 70 people strong and has offices in Hollywood and Toronto. He is currently President of the Will Rogers Motion Picture Pioneers Foundation, and a member of the Executive branch of the Academy of Motion Picture Arts and Sciences. In 2013, he received the Salah M. Hassanein Humanitarian Award, recognizing his distinguished philanthropic service. Davies previously served as President of Worldwide Distribution for Relativity Media (2011-2016), playing an instrumental role in the company’s evolution from a financing and producing entity into a full-fledged studio. With the creation in 2014 of a joint venture company (Relativity EuropaCorp Distribution) between Relativity Media and EuropaCorp, Davies’ responsibilities included oversight of both companies’ domestic and international distribution strategies and working closely with their foreign output partners. Davies was named President of Theatrical Distribution in 2010, after Relativity acquired Overture Films’ marketing and distribution assets. He previously served as Executive Vice President of Theatrical Distribution for Overture Films, where he handled the distribution of such releases as Law Abiding Citizen, Brooklyn’s Finest, The Crazies and The Visitor. Prior to joining Overture, Davies was Senior Vice President of Distribution at Paramount Pictures. He joined Paramount following its purchase of DreamWorks, where he was Senior Vice President, Distribution. Davies worked on such DreamWorks releases as Mission: Impossible III, Dreamgirls, Over the Hedge, Gladiator, Saving Private Ryan, American Beauty, Shrek and Shrek II. Davies began his entertainment career in exhibition working for major theater chains including National Amusements and General Cinema. Born in Texas, he is a graduate of The University of Texas at Austin, where he was the president of his fraternity, Sigma Chi.